Google is an important part of the Internet and there are many people that are not happy about it. They are concerned about their privacy, about the fact that there is way too much power centralized in the hands of a corporation. Although Google was founded on the principle of “don’t be evil”, it became an easy target for sceptics. 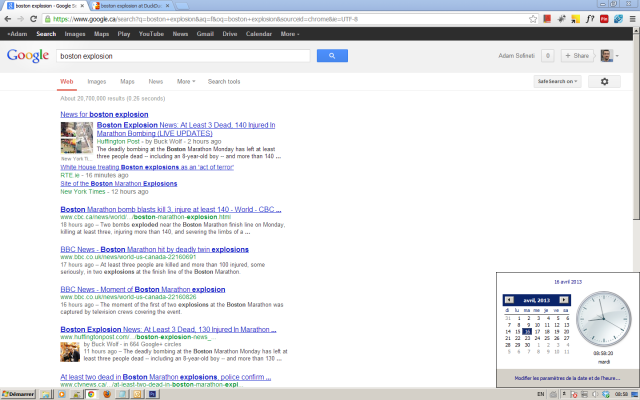 One of the “evils” that Google is blamed with by many, is its algorithm used for the search results. Google will serve up different result to the same query for different people, based on data Google might have about them. I gave DuckDuckGo a spin more than once, and often the results were not that helpful. I remember when hurricane Sandy was approaching Canada, after days of havoc in the US, the top DuckDuckGo results to the query “Sandy” had nothing to do with the hurricane. The same query on Google gave me a legion of useful information, including links to official websites of emergency preparedness. 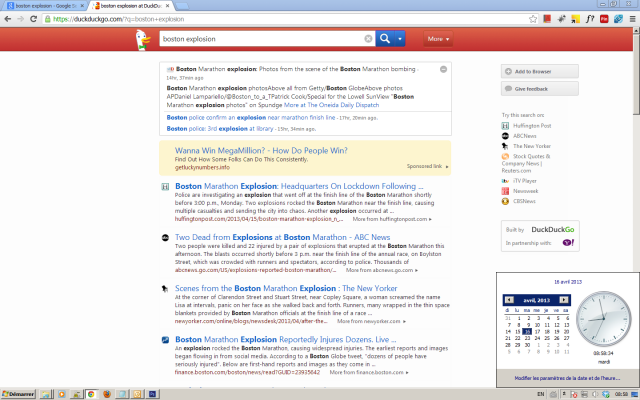 Yesterday, when I learned about the bombings in Boston, like everyone else, I was curios to find out more what happened. My first destination was Twitter, than Google and for the sake of being better informed, I searched DuckDuckGo too. 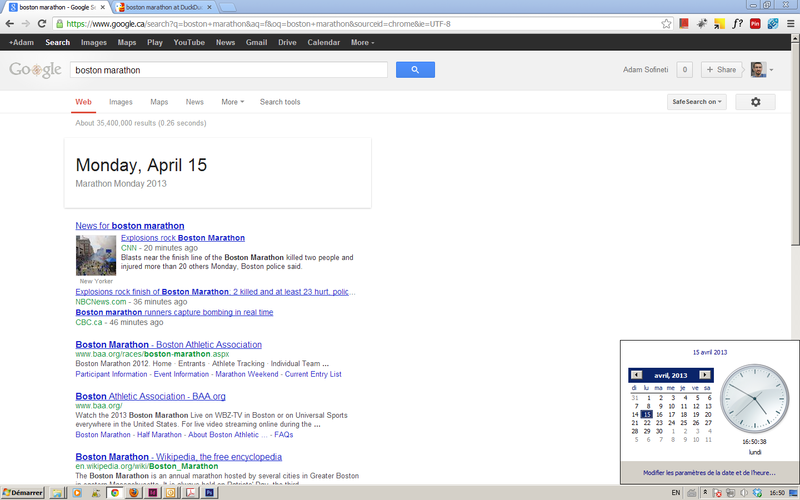 As we can see on the screenshot of the Google results page, the first thing we see is the date of the Boston Marathon, which comes from the Knowledge Graph, a semantic result enhancement introduced last year. 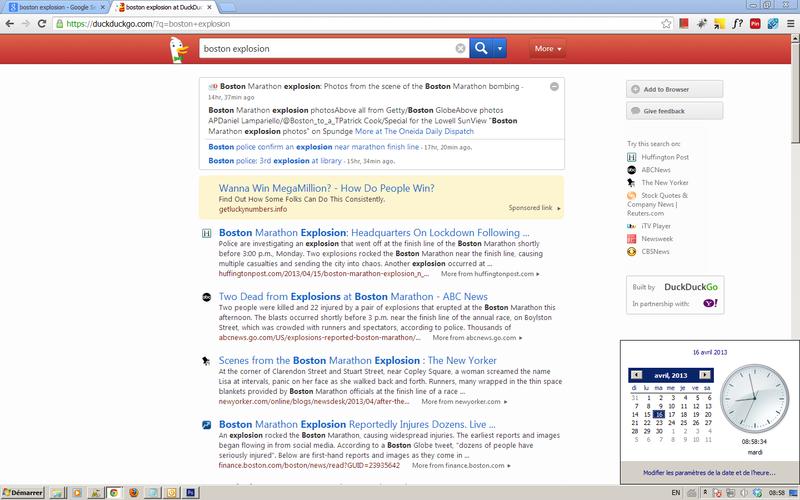 It is followed immediately by headlines from CNN, NBC and CBC about the explosions. 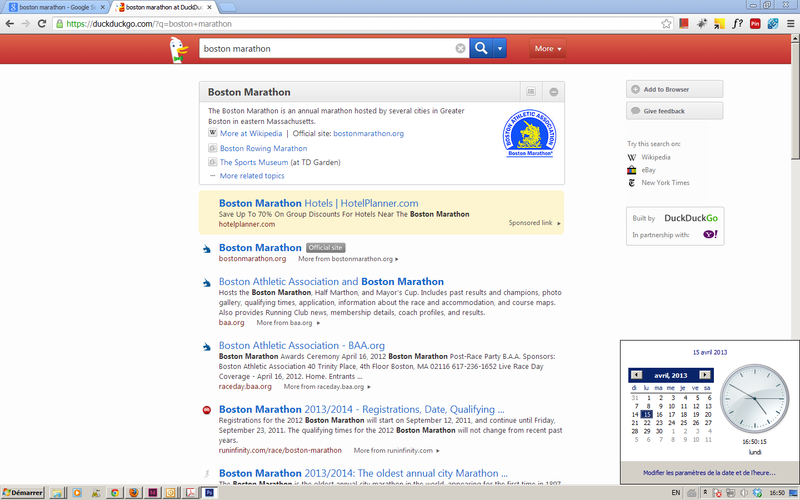 As this was a developing story, after the news headlines, there were the regular search results, starting with the official website of the Boston Marathon. On DuckDuckGo, it was business as usual, with the results, that I have to admit are neutral and unfiltered, but given the moment, with very little value. 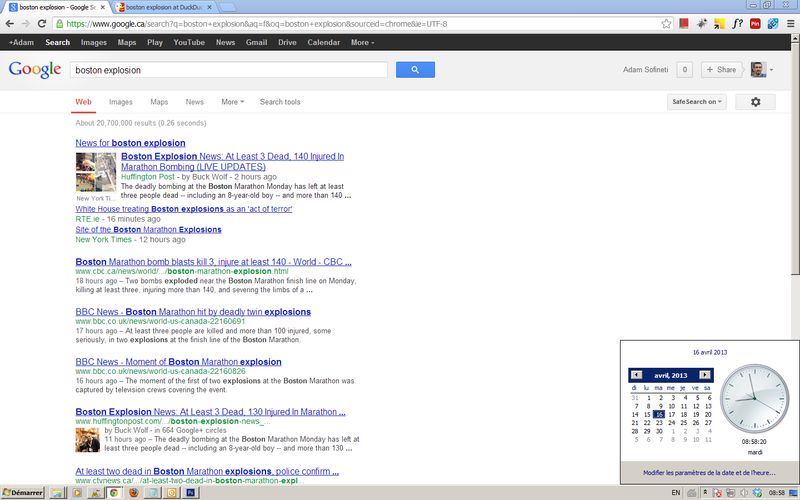 I also got a banner add on the top, inviting me to save up to 70% on hotels near the Boston Marathon. As we can see the Google results are dominated by news about the explosions from the Huffington Post, RTE, NYT, CBC, BBC, etc. DuckDuckGo, gave news results from more or less the same sources, the only difference is that here, the stories are a bit dated. The “Wanna Win MegaMillion” banner is there to prove that DuckDuckGo too, is just another company that wants to make profit. Filter bubbles are a reality; it’s not just Google using them, but many other major online platforms that deal with a huge amount of data. The main reason filter bubbles were introduced was to keep people interested in the content of the platform, in a fierce battle for attention. With a lot of data, you also get a lot of noise and the answer to a question might change, depending of who is asking it, when and where. The danger with filter bubbles is that you fall into stereotypes. A few weeks ago, I wrote about this online art project that is exploring filter bubbles across the world. It’s important to be aware of their existence in order to take results with a grain of salt and to constantly look for new channels of information. Personally, I found the unfiltered results of DuckDuckGo unhelpful and outdated. On another note, as a profit seeking entity, they should have had the decency, not to show ads next to results dealing with this tragedy, at least for a few days.